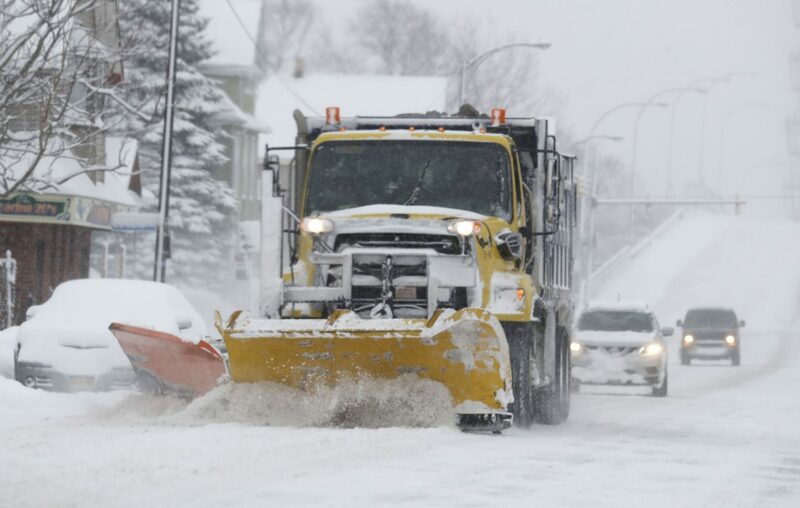 Buffalo police have responded to more than 65 accidents since 5 p.m. Tuesday, but only five resulted in injuries and Mayor Byron W. Brown said Wednesday that while a travel advisory is in effect, state and city officials will decide later whether to impose a driving ban. There also has been no delay in police services, Brown and other city officials said during a midday City Hall press conference to address the storm. Later Wednesday, Brown also declared a "state of emergency" in the city, though it still did not include a driving ban. Brown said the declaration "gives us as a region the ability to ask for (federal) reimbursement for the storm if collectively the costs reach a certain level." The state of emergency is in effect until he rescinds it, Brown said. As for travel in the city, Brown said "we are going to continue to monitor weather conditions at this time. We do not anticipate issuing a travel ban at this time." State plows are focusing on main and secondary roads while city crews are focusing on residential streets, Brown said, adding that about 65 pieces of state and city equipment are on the streets and the priority is clearing those main and secondary roads and hospital routes first. But Brown added that residential streets should be plowed at least once Wednesday. Public Works Commissioner Steven Stepniak said crews will continuing plowing streets overnight. At a second press conference at the end of the day Wednesday, Brown asked residents on side streets to move their vehicles starting at 7 a.m. Thursday to the closest main street where parking is legal so snow plows can clean side streets. Cars will have to moved off the main streets by 1:30 a.m. Friday. Parking meter fees and fees paid through the Buffalo Roam parking app will be waived on Thursday, said Parking Commissioner Kevin Helfer. Brown said residents have generally been cooperative, but Fire Commissioner William Renaldo reminded residents to call if fire hydrants need clearing, to not use portable generators indoors, to not attempt to thaw frozen pipes with an open flame, and to clear their home's outside vents and check smoke detectors. For any nonemergency police or fire calls, such as blocked hydrants, residents are asked to call 851-5333, extensions 310, 312 or 313. They also may call 311. Late Wednesday, Brown said City Hall will remain closed on Thursday. Residents who owes fees paid at City Hall that were due Wednesday or Thursday will have an extra day to make payments without late fees or interest payments, he said. The city's emergency operations center will remain open around the clock during the storm. Deidre Williams – Deidre Williams has been covering Buffalo City Hall for The Buffalo News since 2016. Prior to that, she reported on public schools in the city and was a suburban beat reporter for The News. Williams joined the Buffalo News in 1999.